All Things Crafty: Paper Pieces - How do you do it? I assembled the last 3 blocks of the first pillow by following the paper piece templates. I have yet to trim them down to the seam allowance size of the pieces. Which kinda brought up some questions for me. How do you paper piece? Do you remove the paper as you go? Do you wait until the full block is assembled? Do you use special paper or normal printer paper? Here's my take on the questions... I remove the paper once the block is completed. It's a pain to me sometimes. I've purchased special packs of foundation piecing paper but for the life of me, I can't remember where I put them. Do they really make a difference? I'm assuming I can send them through the printer as well. So, I end up using normal paper from the printer which is what could be my problem removing it :-). Once I get moving on the blocks, I enjoy making them. This works for me: I pre-crease the paper foundations before I start sewing to make them a little easier to tear free. Tweezers are your friend! They are very handy for picking the little bits out of the seam intersections, but I try not to worry too much about all of the little bits - I figure they will wash away eventually. The rule, of course, for paper piecing, is that you don't remove any paper until that piece is sewn to another. But I have been known to break that rule if the fabric is on the straight of grain or if I don't have any really finicky seams to match. I usually wait until the block is complete to remove the paper. Sometimes I'll even wait until a whole section of blocks are together and then just remove the center blocks. I like to keep everything nice and stable. I keep the paper on throughout the blocks and even into the rows. It keeps everything stable. If it's a big pattern that doesn't have lots of intersections, regular paper works. If not, I have a stash of paper piecing paper. Thanks all for your comments! 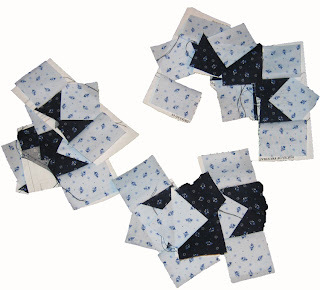 I love hearing how others get their paper piecing done!